Husand: Can I talk to you a minute? Husband: Did you leave this grape in the sink? Husband: I just cleaned the sink. Wife: It is still clean. 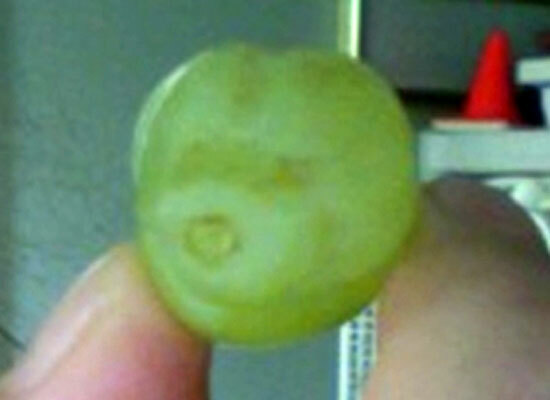 A grape is a skin-covered, contained unit. Husband: What am I supposed to do with this? Wife: It can stay where it is, I think. Husband: No, I have to move it. You left it there, knowing someone would have to move it. Wife: I didn't really leave it there with any particular intent or forethought. Husband: Exactly. Next time, THINK about the consequences. Wife: Okay. [thinks to self: Dude, I have no regrets]. Ahahahaha! Totally been there. Have to go look for scenes 1 thru 4 now. Poor grape, caught in the middle. "Yes, it IS your fault Mommy and Daddy are arguing!!" Poor thing will be traumatized for the rest of his (very short) life.